Now, before we get into this, let us be clear: we respect the individual and highly personal style of each and every one of our users. It’s your own interest in menswear and the larger fashion world that keeps our site ticking day in and day out. That said, we do know that for every Ricked-out and Rafed-up member of our community, there’s a guy who’s looking for a little style guidance. Don’t worry, we see you (and no, we won’t tell). As we slide from summer into autumn, we’re entering a period where temperate days and chilly nights expand opportunities for guys to go full throttle with their wardrobes. All memes aside, this transitional period is kicked off by the global fashion weeks during the month of September, segueing all the way until mid-to-late November. Combined it makes this season feel fresh with a sense of fashion potential; all that time inspires more opportunities for you to find the balance in your closet before we bundle up for the deep winter chill. Of course we know that style is far more personal than what’s “in” or “out” of fashion, but we know there’s a few items that a complete seasonal wardrobe wouldn’t be without. For a few starting points and suggestions from our team, take a look at the listings below each section. We know that most guys have stacks of T-shirts representing more real estate in their closet than any other type of garment. But, in all honesty, how many long sleeve tees do you own? It may sound silly, but the longsleeve tee has enjoyed a bit of a renaissance in the last year or so, thanks in part to the graphically overloaded styles from brands like Advisory Board Crystals, Boot Boyz, Come Tees, Cactus Plant Flea Market, Some Ware and Online Ceramics. With the craze for DIY streetwear and The Grateful Dead only percolating across popular culture (shout out John Mayer as a singular example), the longsleeve tee has proven to be an equally fruitful canvas for fashion-based self-expression—it’s just a larger canvas. Don’t worry, we’re not suggesting that the long sleeve T-shirt is a new development, or something that brands have suddenly latched onto—rather, we’re simply suggesting that when you’re stuck between a T-shirt or a pullover hoodie, the answer might as simple as a longer sleeve. It may sound silly, but let’s face it, the hoodie is the graphic T-shirt of fall. Like a T-shirt in the summer, hoodies practically become a base layer (if they’re not simply worn on their own), with equivalent potential as a canvas for your favorite brands, favorite designs and overall expression of personal style. Like we mentioned in our summer guide, think about wearability and versatility when it comes to your hoodies. Given that this is something you’re going to be bringing with you into the winter months (albeit likely worn under something else). We love ostentatious graphics as much as the next guy, but you’ll end up getting more mileage out of something that doesn’t steal the spotlight regardless of what you wear it with. Naturally we love the ease and clean silhouette of a pullover hoodie (this includes the iconic Supreme box logo; fortunately some are dropping with the Fall/Winter 2018 collection) but going for a zip-up style adds a little function to form (when those warmer days in early fall betray the season’s cooler connotations). Obvious choices range from clean-cut Champion classics, to the streetwear designs of Dime, Palace, Noah, BAPE and—of course, Supreme. Zipped-up or pulled-over, we love when garments have something technical to bring to the table. Whether that’s found in the “designed-down-to-every-detail” work from Acronym, or the creative (and, often colorful) work of Stone Island, pieces from these brands often hide how innovative they are at first glance. If streetwear isn’t your thing, then don’t sweat it—given that designers across the spectrum have created hoodies in all shapes and styles, it’s the perfect piece to reflect your designer-level taste: whether that’s with Alessandro Michele’s eye-catching Gucci graphics, or the crossed-up stripes of Virgil Abloh’s Off-White. Investing in a great denim jacket isn’t just a good decision for fall—it’s quintessentially American. As much of a staple in men’s wardrobes as a great pair of jeans, the only real decision for most guys should be how much they’re looking to spend (if they don’t already have this piece locked up already). While it’s hard to be the classics from the likes of Levi’s or Lee, today’s market includes reinterpretations of the classics from brands like Supreme, and upscale editions from Slimane-era Saint Laurent or Michele-era Gucci. Regardless of your selection, you should always cop something simple before branching out to something a bit louder (for practical reasons, naturally). Of course, that hasn’t stopped us from falling for certain renditions of denim from some of our favorite Japanese brands—especially names like Visvim and Kapital. With the latter’s smiley face print adorning the sleeves of denim and military-inspired jackets alike, there effect is something that manages to combine the retro with the modern; it’s well-known that that Japanese have excelled at reviving and sustaining long-lost arts within denim production—it only makes sense that Japanese designers have managed to make traditional garments (both in cut and style) feel fresh and firmly on-trend. If, after all this, you’re feeling like a denim jacket isn’t really for you, no sweat. Let us recommend either a M-65 or a chore coat. For the former—aside from finding great options by way of your local Army/Navy surplus store—reproduction models with attention to detail can be found be brands like The Real McCoys. For something that really hits at the utilitarian workwear roots of something like a denim jacket, you cannot go wrong with a chore coat. While its four-pocketed silhouette has been perfected by brands like Carhartt, it’s also been given an injection of fashion credibility by icons like Junya Watanabe. No matter your budget or flair for designers, you should be in good company with any of these selections; remember: you don’t need to literally be working to reap the benefits of light-to-mid-weight jackets like these. As the fall starts to near its end (or if you live in a particularly cold region) you’ll need something a little more robust to handle the declining temperature. This is where your leather jacket comes in. It might be a little premature in September, but post-Halloween, this is something you’ll be pining for. Leather jackets come in all shapes, sizes and price points, but there’s a few universal truths that you can carry with you throughout the shopping process. Starting with silhouettes, there’s a few that you’ll find just about anywhere. These include: the rider jacket (pioneered by the iconic and infamous Schott Perfecto), the racer jacket (made popular by names like Steve McQueen) as well as the collared A-2 and collarless MA-1 flight jacket silhouettes (which rose to fame following the return of World War II servicemen). These styles are perhaps the most easily discovered silhouettes. While traditional brands like Schott have built their names on top of crafting quality jackets in these silhouettes, Acne Studios, Saint Laurent, Undercover and many others have crafted high fashion takes on rider jackets—among others. Given its connection to rock n’ roll and biker cultures the rider is the style that’s sure to earn you the most bang for your buck—especially if you’re putting the money down on a piece from a classic purveyor like Schott. That said, a more unconventional or avant-garde approach to this staple garment might be that in the “fencing jacket” style. With asymmetrical zippers and a high (but not too high) collar, this style has been perfected by niche designer brands ranging from Rick Owens to the the cultish Carol Christian Poell and Julius. Once you’ve found your desired silhouette, it pays to pay attention to the detail to get the most for your money. Speaking of money, you should expect to spend at least $500 (while we’re speaking in generalities, it’s hard to imagine that a quality, durable leather jacket—used, but especially brand new—would go for less than that. Higher cost jackets general incorporate more thoughtful details—think higher arm holes and slimmer silhouettes—because their higher price point means they don’t have to appeal to a wider audience to cement a sale. Again, this is high cost-per-wear piece, so while the investment is certainly steep, think of this item that you’ll wear all fall and into the winter—year, after year, after year. In terms of materials, you’ll find that cow leather and lambskin will be the most common, most likely in black. While cow leather is more common and more durable, lambskin is more supple, and as a result, more expensive. If you’re undecided (and can throw a little more cash) then consider calfskin; the material has the durability of cow leather but the suppleness of lambskin in exchange for a higher tag price. For an especially autumnal twist on this style, opt for suede over cow leather or lambskin; while it’s not suggested that you expose your leather jacket to large amounts of wet weather, any significant amount of water will destroy suede, so keep that in mind. Before we forget, traditional varsity and letterman jackets—while boasting a wool body—typically boast contrasting leather sleeves. While these jackets can be lined or quilted (meaning they’ll likely get very toasty, very quickly) they’re a classic part of fall style thanks to their connections to heading back to school. If none of these above options seem to grab you, you can always lean on this academic staple. We get it, vests aren’t probably the first thing you’re planning on working into the rotation when the temperature starts to fall (pun not intended) but hear us out. Thanks to the innovations from brands like Matthew Williams’ Alyx (including its partnership with Nike), the utility vest has never been more stylish, managing to strike a balance between futuristic aesthetics and pure utility. Utility is an important adjective here, given the piece’s inherent focus on utility for the wearer. Sure, you can make jokes that a vest is just a jacket without sleeves, but that dismisses the garment’s practicality; given that autumn is filled with days featuring cold starts but hot days, a great vest is your best bet when it’s too cold for a long sleeve T-shirt but bound to be too hot to wear a full-on jacket. Like the “clout packs” (waist bags for the uninitiated) popularized during the summer months, the light top-to-mid layer is all the more desirable for providing a sleek way to add more pockets to your kit without—ideally—adding any major warmth or insulation. While brands like Rocky Mountain Featherbed, Kapital, Engineered Garments and those in the Nepenthes brand family have spent seasons reproducing and recreating retro-inflected western, military and fishing-style utility vests, those aren’t your only options. For a late 20th century, retro-sportswear vibe, consider fleece iterations; Nike ACG’s Fall/Winter 2018 collection contains plenty of fleecy vests in a roster of throwback color combinations. To avoid looking like a dad at Old Navy, experiment with expressive colors, puffier fleeces (aka, go for something thicker) or bold branding. For something more futuristic, try looking at the techwear stalwarts—Acronym, Stone Island and Guerilla Group—for streamlined options that are light years ahead of anything you might have worn back in the late-’90s. If none of the above grab your attention, then look no further than fashionable classics from brands like Rick Owens, Raf Simons and especially Helmut Lang. The latter’s bulletproof vest-inspired version is a fashion icon in its own right and is referenced as often as it’s reproduced. Unless you’re really a glutton for punishment, you’ll need to swap in some new denim for the fall season. Again, like your T-shirts, we recognize that you’ve already got a few pairs that are well-loved in your rotation. But given the fall’s fashion connections (and thinking about the sweaty days of summer), it’s definitely worth considering a denim refresh. You can’t go wrong with a pair of clean, mid-to-dark indigo selvedge. Given the technique’s permeation into popular consciousness in the last four to five years, finding jeans with this type of finish (when in doubt, look for the red thread on the bottom hem) shouldn’t be a stretch. 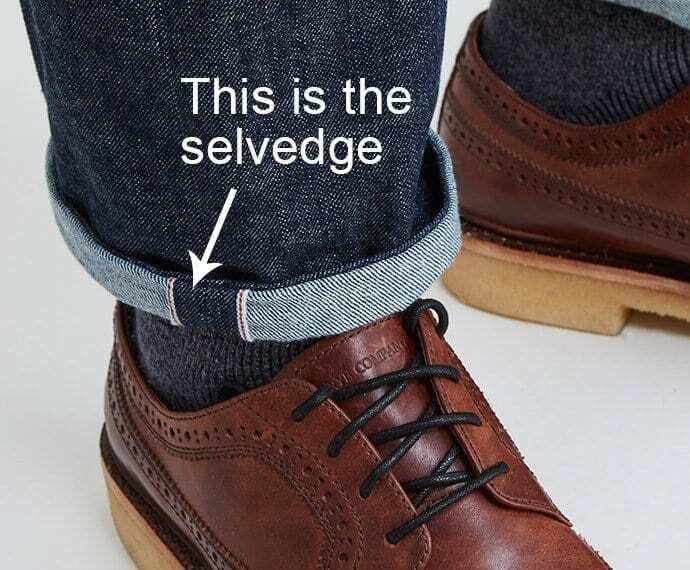 With both mass market and cult Japanese labels serving up selvedge year-over-year, you should be able to score a presentable pair that should work all season long. But while the aforementioned dark blue selvedge should suffice during Thanksgiving holidays and workplace meetups, we’d be remiss for not mentioning a few alternatives. Thanks to designers like Junya Watanabe and Takahiro Miyashita, there’s several variations on the traditional blue jean. Watanabe often adorns his denim with various patches in a style that’s reminiscent of his native Japan’s “boro” style. Takahiro Miyashita’s “The Jean” provides a rendition that sews various different jean segments together for a look that’s stitched up but surprisingly straightforward (with this style in particular, watch out for flared leg openings—thanks in part to the literal cut-and-sew technique used). In our summer guide, we showcased and suggested some lowtop trainers in lightweight, techy fabrics. For fall, we’re suggesting that you go a little higher… like mid and high top sneakers. Styled like a pair of boots, a great pair of high tops can be as simple as a pair of retro Jordans, or as fashion-facing as a pair of Rick Owens Geobaskets (or “Dunks” for those who are in the market for something truly grail-worthy). While we’re in agreement that stacked denim isn’t nearly as on-trend as it was back in the early-2010s, there’s something to be said about swapping your summer-worn pair of dad shoes for something a little different. Besides, given the push for wide leg trousers and ’90s-inspired straight leg jeans, any shoe height hovering around the ankle should tuck neatly under most hemlines. If you’re trepidatious about how a higher-sitting footwear silhouette will look, consider keeping a straight leg, but cropping the bottom hem a little higher than normal; your sneakers will be unobstructed in the context of your ‘fit, and besides—fall’s not that cold until late October to early November. There’s no question that waist bags and shoulder bags have been swinging back into the popular consciousness since the tail end of last year, coming into a fever pitch during the summer (thanks in no small part to support from across the streetwear and fashion spectrums). But blame it on the air of “back to school” or blame it on the upcoming round of autumnal long weekend trips, but you’re gonna need something bigger than a waist bag. Enter the (not-so-humble) backpack. Thanks in no small part to the proliferation of streetwear into luxury’s highest levels, but when it comes to copping a backpack there’s plenty on offer. Of course you can always go with a classic utilitarian model, ranging from Jansport and Eastpak “bookbag” silhouettes to the rugged, hiking-inspired iterations served up by the likes of Patagonia, The North Face and Arc’teryx. This is to say nothing of the myriad backpacks offered by Palace and especially Supreme; Supreme’s backpacks often incorporate Cordura nylon—an affordable, durable and underrated fabric. But, as always, if you’re looking to really flex from both the front and the back, then know that nearly every major designer has a backpack meant for equally upscale portage. Want something top-tier but utilitarian? Try a piece from Japanese favorite Porter. Love the stylings of Alessandro Michele’s Gucci? With or without the interlocking “G” monogram, Gucci’s got you. Speaking of monograms, you can’t go wrong with anything from Louis Vuitton who—aside from building their brand on a core of luggage offerings–are riding high after a blockbuster show from recently installed menswear designer Virgil Abloh. We’re not saying that sling bags and waist bags are going anywhere anytime soon; a blend of form and function, as long as it’s styled correctly (notably, across the chest) then fans of the silhouette have nothing to fear. But if you’re packing for an autumnal getaway, you’re gonna need a little more on-the-go storage.